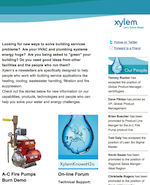 From the world’s tallest buildings to its driest places, Xylem - Applied Water Systems brands provide solutions to keep the water flowing, while sustainably managing our most precious resource. Lowara plays its part in Bahrain’s global ambitions. Pumping up the power in Cyprus.